Robin makes his choice between cornflakes and marmite. 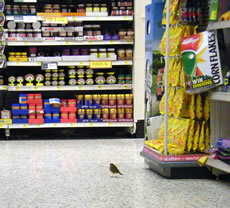 Vin Miles has alerted ActonW3.com of an unusual visitor to Morrisons. He emailed earlier today to say: "I thought W3.com readers might be interested in this photo, taken this morning, of a robin which is currently trapped in Morrisons, and has been for a couple of days." Morrisons is generally busy, and on particularly frenetic days it seems to some like Heathrow Terminal 5 at a standstill, but the robin, according to Vin, "seems happy enough, hopping and flying about. It appears quite tame, but when approached too closely it hops under the shelves, emerging in the next aisle, which is a neat trick, but can't seem to find the way out." He continues: "While it may have enough to eat over on the bread counter, it may be getting a bit thirsty, though it could perhaps eat ice from the open freezers. Thank goodness it's not a pigeon." Vin definitely wins the prize for the most original Acton snap of the week.